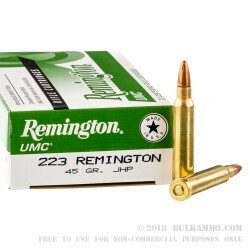 This 223 Rem cartridge from Remington’s UMC line of rifle ammunition is designed to accommodate high-volume shooters with its affordable price, but never at the expense of compromising quality or performance. 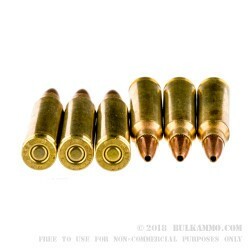 The round’s 45 grain projectile features a full metal jacket, so you may shoot for a very long time before residue accumulation demands that you clean your bore for the sake of your accuracy. The bullet’s hollow point will cause it to expand dramatically upon impact with a target, which in conjunction with its muzzle velocity of 3,550 fps makes it just the thing for surefire results while varmint hunting. 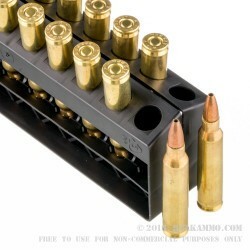 All UMC ammunition is manufactured right here in the United States. 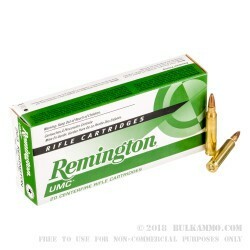 You’ll see that these 200 rounds’ precise factory fresh brass casings, reliable primers, and uniform propellant loads are all worthy of Remington’s respected name. They are also perfectly reloadable, so as much as we’d like to see you back soon, we know that will take a while if you’re handy around a reloading bench.